I went for a run a few days back - just before our latest cold snap - and happened to leave just before sundown. Gravel crunched underneath my blue running shoes as I ran around the Reservoir near Boston College's campus, the air was cool and crisp and I felt grateful to get an hour away from my desk. At a certain bend in the road, a pristine spot where there's enough of a gap between the tress to allow an unobstructed view of the sky, I saw a teenage girl. She was just standing there, one arm held out in front of her face. She was, I am assuming, snapping "selfie" pictures: those pictures one takes of oneself in various locations. This was a gorgeous location. Perhaps the earth was tilted just right, but a molten red sun was just kissing the earth's horizon directly behind her. Seen from where I was standing (I sort of slowed to a bit of a walk) it looked as if she had donned an oversized halo. In a word, the sunset was gorgeous. The girl knew it, too, but didn't turn to see it. Instead, she seemed to need to superimpose herself upon it. It's not this particular instance of "taking selfies" that fascinates me. Rather, I'm curious about the phenomenon in general. Is the Selfie 'art' or is it simply self-inflation? Is it authentic creativity or narcissism? I ask this because whether it be on trains or in major cities, beautiful vistas or college campuses, I see a lot of people taking their own photos. These aren't group shots, no one encourages them to "say cheese." It's simply self-directed, self-shot images. Remember, the myth of Narcissus was of a young man so smitten with his own beauty that he spent his days staring at his reflection. 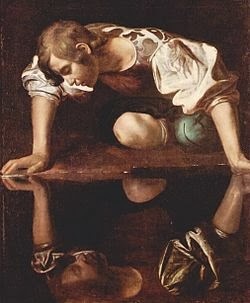 Is the selfie simply an updating of this myth, giving Narcissus the permanence of his reflection while offering him as well the mobility of a cell-phone mirror? William Desmond, the Irish-born philosopher whose books have not been far from my hand this last year, muses about the "truncated, narcissistic selfhood that is infatuated with its own fatuous reflection." For Desmond, true works of art have the capacity for arresting over-inflated senses of self: the beauty of art draws thew viewer from his or her own reflection toward a radiant work of beauty. As budgets for the arts continue to be slashed and as we put increasing pressure on students to strive for quantitative success (GPA, test score, logged service hours, etc. ), perhaps we should ponder on what seems to be a fundamental need by humans for beauty, for art. We must cultivate an aesthetic sensibility among our students, exposing them to great works of art (musical, visual, natural) not in order for them to put themselves in the picture, but in order that the horizon of their world be broadened to include a form of beauty that does arise from them. We must allow for the beauty of otherness, a beauty not of their own making or under their control, to throw them off step and to call them away from excessive self-gazing...whether it be in a pool of water, a mirror, or the screen of a cell phone.